I showed this off over at SoS' forums a month or so back when I found my old code and files. I was planning on scrapping what I had and starting over but I was convinced by a few people to tidy up what I had and release it, so here it is. The mod is no way what you'd call "finished", just releasable so I'll welcome any feedback about problems getting it to work and such, but I couldn't care less for feedback about it being any good or the gameplay sucking as I'll now be scrapping this code, figuratively speaking, and starting over, so those pieces of feedback won't be at all relevent. 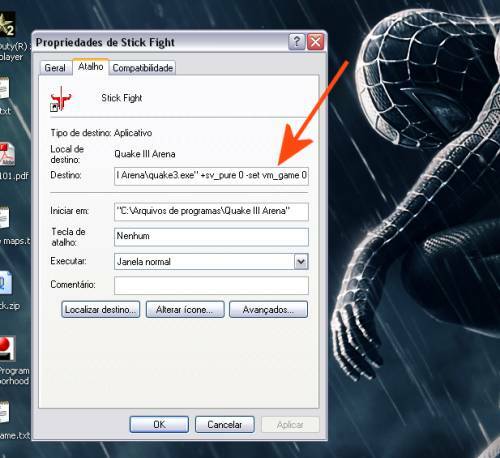 If you don't have Quake 3 then download OpenArena from here, you can play Stickfighter with that. Stickfighter is a fast paced, third-person beat-em-up mod for Quake 3. With an array of brutal attacks, all three of them, you must pummel your opponents into the ground using your kung-fu! You can also block if you're a scaredy-cat. Join the huge* servers and fight thousands* of people online** now! ** if multiplayer works, I haven't tested it, I'm the only one who has it as of this writing. 3. Right click on the shortcut and left click on "Properties"
5. Double click the shortcut and play! will I be able to run this under linux? it's pretty interesting. =( but I couldn't find a high enough place to jump and get hurt. so I installed this sf mod on to open arena, and when I double click the shortcut I get error and increased display brightness. Any suggestions? But now I can't start the fighting. I just hit the "fight" button on the lower right corner of the screen but nothing happens. What do I do??? Try bringing down the console and typing "/map stick_dojo"
allrighty, got it running now what do I fight against? wwaaat I can play this on lan!!! awesome!! all my buttons(most) are invisible..
by the way...how do I load other maps with bot support? is in this place that put the shortcut config? *laughing out loud* Alex this is awesome, the d/l wouldn't load for me yesterday just tried it again now, worked fine. Just played a bot on q3dm4 *laughing out loud* awesome!! @Dale, if you wanna load a map and you know its name press the "Â¬" key on the left hand side of the number one key to bring down the console. You can then change the map from in the console, by typing..
*laughing on the floor out loud* it's awesome! played this for a bit over lan...it's accually pretty fun. being able to counter a persons attack would be really good..because here you have to always dodge if there flying at you, because they have priority if they attack first. but still just the fact that we are stick peopel runnign around in 3d and doign flips and poo, is fun. The Dojo map doesn't support bots yet hehe, regular Q3 maps obviously have bot support so you can use any Q3 or BFP map even in StickFighter. have you dumped your project, Alex?